South Jersey community invited into artist studios to learn about the creative process. Artists collaborate to present original works for sale to the public. 4+ Towns 4 Art, founded by Haddon Township fiber artist Jennifer Talarico, presents the second annual Open Studio Tour. Showcasing artists in four towns in 2013, the Studio Tour has doubled in size for 2014. Eight towns are highlighted — Barrington, Collingswood, Haddonfield, Haddon Heights, Haddon Township, Merchantville, Oaklyn, and Pennsauken — with 25 artists participating. Studio disciplines include painting, ceramics, fiber arts, drawing/illustration, photography, sculpture, mosaic, collage, leather work, and book art. 4+ Towns 4 Art is a celebration of visual art in the South Jersey community. With a mission to give local, independent artists a platform from which to share their creative process with the community in which they live, 4+ Towns 4 Art intends to encourage the financial support of those artists by presenting their work for sale directly out of their studios. The Second Annual Open Studio Tour is free & open to the public. All members of the community are welcome to visit the studios on Saturday, April 5, 2014, from 11am to 5pm. Artists will be demonstrating and displaying their creations. There will be an artist reception following the Tour at: EilandArts Gallery, 21 S. Centre St., Merchantville from 5:30pm – 8pm. Visit www.facebook.com/4Towns4Art for details and artist bios. Thank you to NJ arts maven Pauline Jonas for providing DoNArTNeWs with this press release. This entry was posted in Art, Art Galleries, Art in New Jersey, Art Opportunity, Art Tours, Ceramics & Sculpture, Collage, Collectibles, Crafts, Drawings, Encaustics, Fabric Art, Fashion, Fiber Art, Furniture, Glass Art, Jewelry, Mixed Media Art, New Jersey Art, New Jersey Art Galleries, New Jersey artists, NJ, Open Studio Tours, Paintings, Pastels, Pottery, Prints, Public Art, Recycled Art, Sculpture, Uncategorized, Watercolors, Works on Paper and tagged 4+Towns 4 Art, Art, art opportunity, Barrington, Collingswood, DoNArTNeWs, Haddon Heights, Haddon Township, Haddonfield, Merchantville, mixed media art, New Jersey Art, Nj Art, Oaklyn, Open Studio Tour, Pennsauken on March 20, 2014 by admin1. 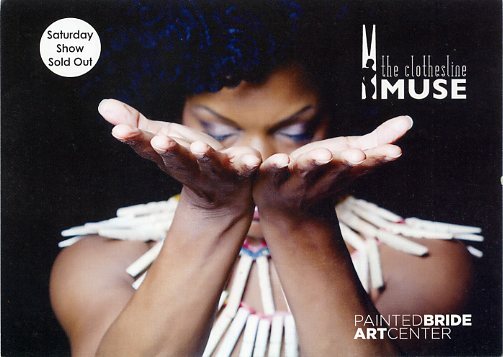 Exhibition includes art, images, artifacts, and stories from the The Clothesline Muse PHILADELPHIA, PA—The Painted Bride Art Centers Gallery is the setting for an exhibition of more than 100 works that explore historical and contemporary visual artists’ relationship to the Clothesline. On view March 7 – April 12, 2014, Clothesline Musings | Art Inspired by The Clothesline includes artists Allan Freelon (1895-1960), Earl Horter (1881-1940), Beverly McIver, Howardena Pindell, and Maya Freelon Asante, as well as artwork selected from a national call for artists. This multimedia, interactive exhibition is inspired by the grind and grace of domestic life. A diverse range of visual media is presented: fine art, photography, prints, sculptures, installations and digital art created by artists’ interpretations– literal, figurative, and abstract– of the clothesline, hand washing and line drying, clothesline games and memories, and the environmental impact of taking in the wash. Clothesline Musings | Art inspired by the Clothesline will run in tandem with thepremiere of The Clothesline Muse, a multi-disciplinary theatrical production that explores the clothesline as a metaphor of our community lifeline and its ties to our environment. The exhibition will also take a closer look at the set and stories behind The Clothesline Muse– showcasing archival images, artifacts from hand washing, visual projections and music from the production. Clothesline Musings | Art inspired by the Clothesline will run in tandem with the premiere of The Clothesline Muse, a multi-disciplinary theatrical production that explores the clothesline as a metaphor of our community lifeline and its ties to our environment. The exhibition will also take a closer look at the set and stories behind The Clothesline Muse– showcasing archival images, artifacts from hand washing, visual projections and music from the production. This entry was posted in Art, Art Galleries, Art in Philadelphia, Art Spaces Philadelphia, Fine Art Philadelphia, Installation, Mixed Media Art, Multimedia Art, Performance, Philadelphia, Philadelphia Art, Philadelphia Art Galleries, Philadelphia Art Shows, Philadelphia Theater, Uncategorized and tagged Art, ART INSPIRED BY THE CLOTHESLINE, Art Installation, CLOTHESLINE MUSINGS, DoNArTNeWs, mixed media art, Philadelphia, Philadelphia Art, Philadelphia Art Shows, Philadelphia Fine Art, Philadelphia Performance Art, Philadelphia Theater, THE PAINTED BRIDE ART CENTER on March 10, 2014 by admin1. All of a sudden my artwork is everywhere! Today is the artist reception for Home Fine Art and Framing Gallery at 2 Church Street, Mount Holly, NJ 08060 (609) 261-8634. I was invited by the irrepressible Ben Cohen and proprietor Kathryn Spear to be a guest artist. I have three photographic prints and a digital print of QR codes that links to websites, animated gif and videos. Thanks to Pauline Jonas and Jeff Stroud my photography is included in the Photographic Society of Philadelphia group show at Galleria Deptford, 1011 Cooper Street, Deptford NJ. Read my review of the show on DoNArTNeWs here. And this week I’ll be installing four large photographic prints at the Bargain Book Warehouse, 121 East City Line Avenue, Bala Cynwyd, in the Bala Shopping Center, thanks to my good friend Eva Preston. Read my profile of Eva here. Thanks to all my good friends for making wonderful art opportunities happen. I hope to see you there or there or there. This entry was posted in Art, Art Galleries, Art in New Jersey, Art in Philadelphia, Art Spaces Philadelphia, Book Arts, Books, Computer Art, DoN Brewer, DoNArTNeWs, DoNBrewer, Fine Art Philadelphia, Galleria Deptford, Mixed Media Art, New Jersey Art, New Jersey Art Galleries, Philadelphia, Philadelphia Art, Philadelphia Art Clubs, Philadelphia Art Galleries, Philadelphia Art Studios, Philadelphia Artists, Photographic Society of Philadelphia, The Plastic Club, Uncategorized, Works on Paper, Writing and tagged Art, Art Installation, DoN Brewer, DoNArTNeWs, Galleria Deptford, Home Fine Arts Gallery, mixed media art, New Jersey Art, Philadelphia Art, Philadelphia Art Shows, Philadelphia Artist, Philadelphia photography, Photographic Society of Philadelphia, Photography on March 8, 2014 by admin1.